The Weminuche Wilderness spans the Continental Divide and at nearly a half million acres is the largest wilderness area in Colorado. 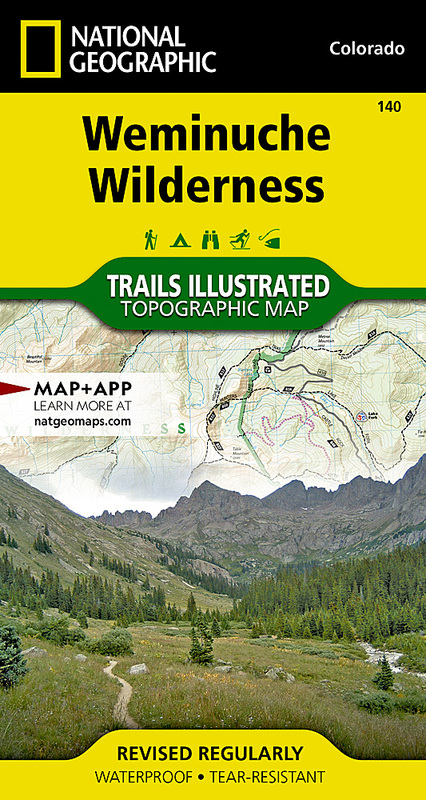 Expertly researched and created in partnership with local land management agencies, National Geographic's Trails Illustrated map of Weminuche Wilderness provides an unparalleled tool for exploring this rugged country and its fragile ecosystems. This map offers unmatched detail of the entire park including such key areas of interest as Big Meadows, Williams Creek, and Rio Grande reservoirs; the Rio Grande and Animas rivers; Wolf Creek; and three fourteeners, Mount Eolus, Sunlight Peak, and Windom Peak, located in the San Juan Mountains. The map also includes the San Juan and Rio Grande national forests. With miles of clearly marked trails including portions of the Colorado and Continental Divide trails, and the scenic roadways Silver Thread and San Juan Skyway, this map will prove invaluable whether you're taking in the scenery on foot or by car. Whatever the season, you'll find this map a useful tool in pursuing a host of recreational activities. Alpine ski areas, hard surface and mountain bike routes, campgrounds, trailheads, boat ramps, fishing access, and ATV trails are all noted, as are historic townsites and mining camps. The map base includes contour lines and elevations for summits, passes and many lakes. Other features found on this map include: Mount Eolus, Needle Mountains, Rio Grande National Forest, San Juan Mountains, San Juan National Forest, Sunlight Peak, Weminuche Wilderness, Windom Peak, Wolf Creek Pass.